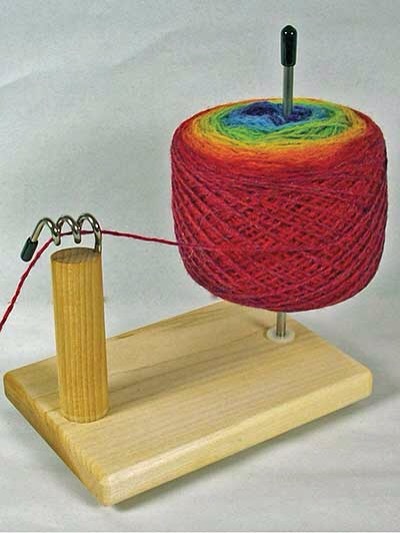 Most yarn artists (knitters, crocheters, etc) I know hate having to chase after their yarn while they are working on a project. There are loads of things out there to help keep yarn contained like bags, Yarn bowl, or the Yarn Pet (pictured below). There are too many bags to count or to try them all. So I’m going to just talk about ceramic yarn bowls and the yarn pet. Both of them pretty much require you to cake your yarn, which you can do by hand or you can use a yarn ball winder, which is easier, but more expensive :D. Now onto the good stuff. A ceramic yarn bowl basically is a bowl with a curved channel (like a letter J) sliced out of one side of the bowl. That is where you thread the yarn through with the yarn ball in the bowl, so when you pull on the yarn, the ball of yarn, it stays in the bowl. There are several sizes of yarn bowls, ones for one ball, and ones for two balls. One thing I really like about the ceramic yarn bowls is the weight, it won’t move when you tug on the yarn. Also, you can do either a center pulled ball or unwind the ball from the outside. But it’s ceramic, not good for traveling. The Yarn Pet is a very cool little devise. It comes in two sizes: for one ball or Two balls (the one ball one is pictured above). It is very light weight, so it moves when you use it, and you have to unwind the ball from the outside, no center pulled balls. BUT it breaks down easily so it can travel with you. I use a C clamp to help hold it in place on the table I’m using it at when I’m out. I’m debating wether or not to buy some flat weights and attaching them to mine to see if that would help keep it from moving so much. Obviously, I use my ceramic bowl more when I’m home. But when I’m out, I use the yarn pet. It keeps my yarn contained and off the dirty floor. I hoped is little review has helped you! This entry was posted in knitting.